Understanding what constitutes a healthy diet can be bewildering and stressful. Even as a future Registered Dietitian Nutritionist with 7 years of nutrition education under my belt, I sometimes find myself confused about the best way to eat. There is a lot of conflicting information out there. Much if it, while not based in sound science, is still extremely compelling. But there is one thing you can always count on – vegetables. And this Mediterranean salad is the perfect way to include some fresh, colorful vegetables in your diet. Vegetables have always been in vogue, for good reason. They are an excellent, low calorie source of vitamins, minerals, fiber, antioxidants, and other healthful phytochemicals. They have been shown to reduce your risk of diabetes, cardiovascular disease, hypertension, high cholesterol, and even certain types of cancer. Those are just some of the reasons why I make sure I eat some vegetables every day. And they don’t have to be fancy. 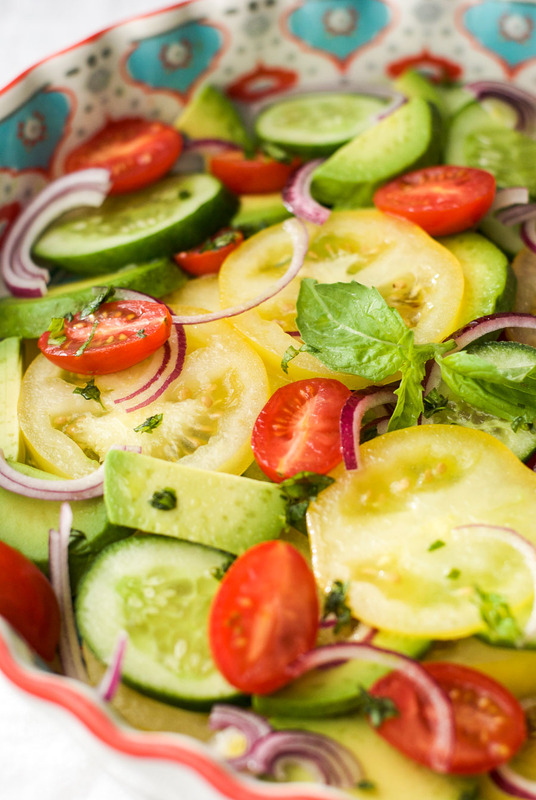 Even cut up raw vegetables are an excellent way to increase your daily intake. 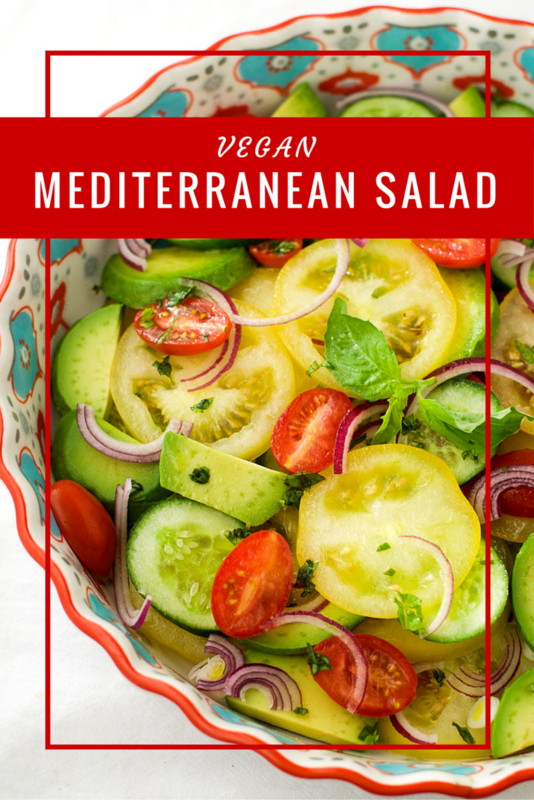 This Mediterranean salad is another great way to reach your daily quota of vegetables. The rainbow of colors makes it a beautiful addition to any meal. But those colors also mean that it contains a wide range of phytochemicals. Fruits and vegetables are different colors due to their different phytochemicals. They are the compounds that provide many of the health benefits of fresh produce. That is why it is so important to eat a rainbow of colors when it comes to fruits and vegetables. This vegan salad can be thrown together in no time, and benefits from a simple home made dijon vinaigrette. 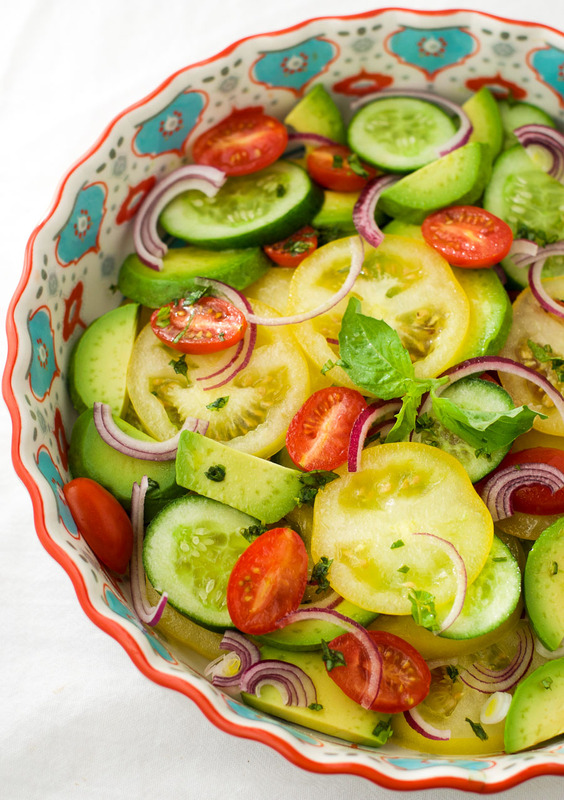 This colorful Mediterranean salad is full of bright colors and fresh flavors. 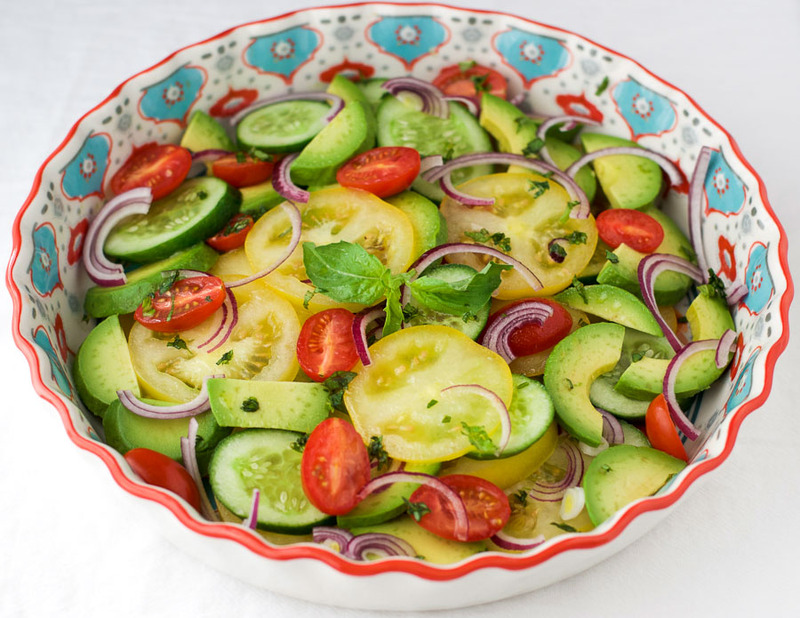 Slice the large tomatoes, avocado, cucumber, and red onion, and lay them out in a serving dish. Halve the baby tomatoes and add to the dish. Chop the basil and sprinkle over the salad. In a small jug or cup, whisk together the mustard, olive oil, balsamic vinegar, lemon juice, and salt and pepper to taste. I love this salad – and Brian Wilson would too. He loves his “Vegetables” (check out the song if curious)! Speaking of rainbow colors, are Heirloom (spelling??) tomatoes really all that I hear they are?? I just listened to that song. I hadn’t heard it before. I love it! I do think heirloom tomatoes taste better. And they are just so beautiful. Yum! I love all of those ingredients,so healthy and delicious. YUM! Salads that are based on veggies and not lettuce feel more like a “meal” to me – this salad would make a great lunch! I’ve never thought about that Brigitte, but you’re right. Thanks for the comment.